We’re massive fans of everything that comes out of the Huge MOTO Design. 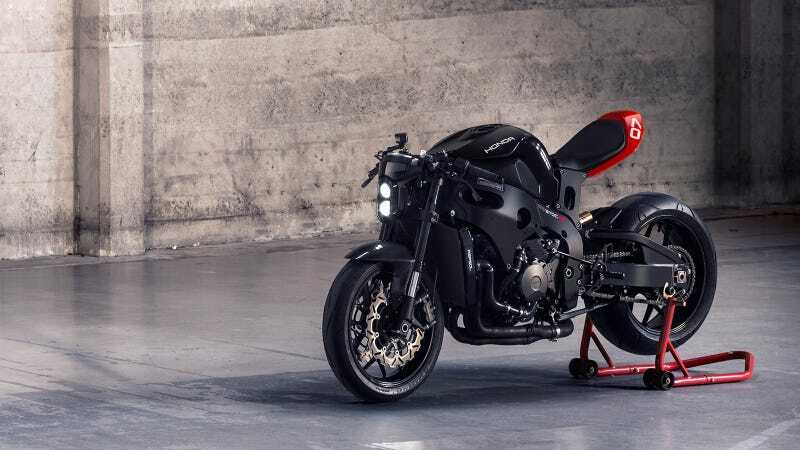 Their latest bike, the Huge MOTO ‘Black,’ which was released last night at Piston & Chain in San Francisco, California, is our favorite to date. The best part? Now you can own one for $3,000. The Huge MOTO ‘Black’ comes as the fraternal twin to the first bike Huge MOTO built using the CBR1000R as the foundation - the Huge MOTO ‘RR Stoc.’ We say fraternal because, if you look closely, you’ll notice the headlight cluster has changed slightly, moving from four LEDs to two, and the ‘Black’ gets trick little turn indicators mounted inside your levers. Many have criticized the Honda superbike for being long in the tooth and falling behind as other liter bikes get more power and fancy electronics. The team at Huge MOTO thinks those are the exact things that make the CBR1000RR a good donor bike because it means the bike is less complicated to dive into and donor bikes are more readily available - not to mention that beautiful machined main frame or Honda’s reputation for build quality and longevity. If you look at the parts list for the kit, you’ll notice that they’ve done a number of things not included in the kit to make their bike extra special. None of this should come as a surprise given the price, but it’s important to note that the kit does not include a black tank, exhaust system, Ohlins suspension, or black hoses. What it does include is the bikini fairing, stacked headlights, new ignition and speedo mount, custom tail section with integrated brake/turn indicators, a pair of levers with the super slick integrated turn indicators, and all of the required mounting hardware and instructions required. The top triple needs to have the ignition guard cut off or replaced with aftermarket triple. Powder coat the modified triple (top and bottom); their bike had silver triple that came stock — some black CBR models actually shipped with black units. Stock brake lines were replaced with black translucent braided Core Moto lines. Brake reservoirs were replaced with black anodized Rizoma units. Turning your bike into the beauty you see here is as easy as following this link.